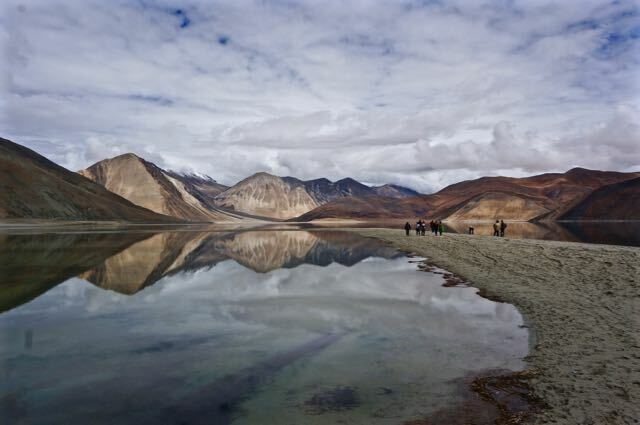 Pangong Tso lies on the Indo-Tibetan border with about 60% lying in Tibet and the rest in India. It’s a saline lake, but freezes completely in the winter. 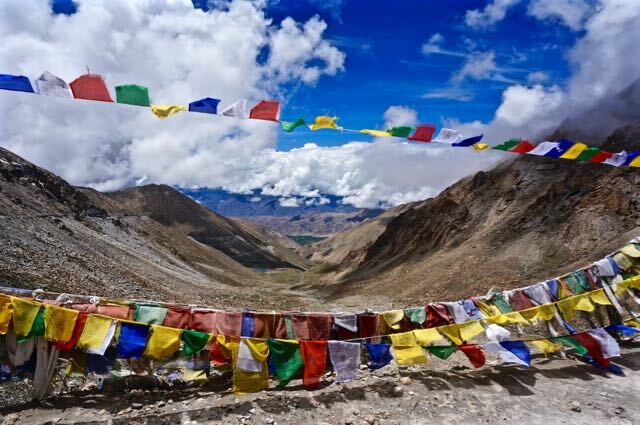 At 14,270 ft (4,350m) the weather is pretty unpredictable and cold. 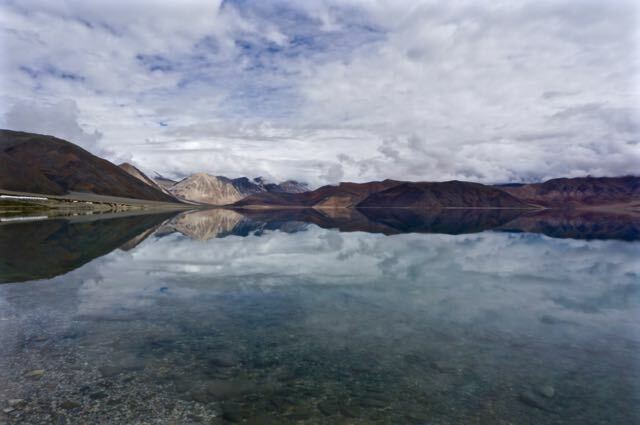 The name means “long, narrow, enchanted-lake” in Tibetan. The area is disputed territory by China and India. The Line of Actual Control passes through the lake and incursions are common from the Chinese. 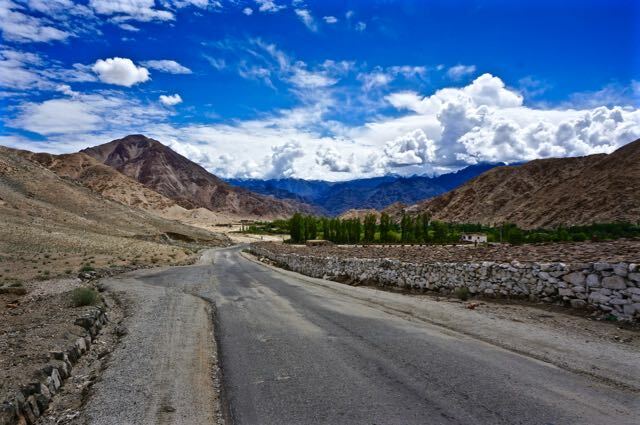 Like with Khardung La and Nubra Valley, foreigners have to get an Interline Permit to visit, but it’s easy to obtain in Leh. You’re supposed to be a group of at least two, but the tour agencies that apply for you just group singles with others that apply. I almost didn’t make it to the lake. The night before, I tried heading a little ways in to get a head start and was stopped in my tracks by a massive cloud burst. I had to head back down to the little crossroads village of Karu. Luckily some really nice people at a campground let me put my tent up. 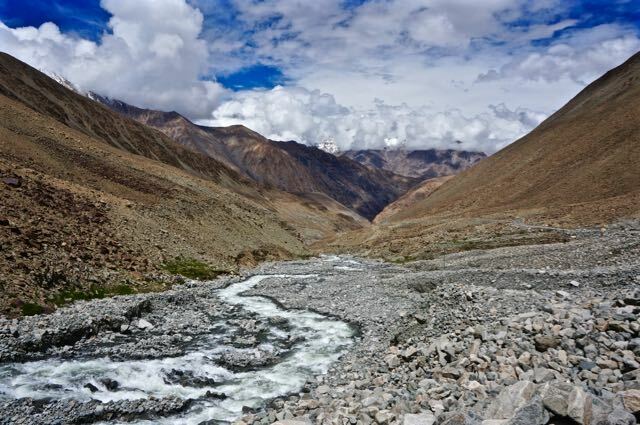 It was right along the Indus River. The lady was super sweet and invited me to join them for a big family style meal. The Nepali chef made me a bucket of hot water for my foot, which was boiling hot for about twenty minutes. They all were making fun of me because I couldn’t handle putting my foot in it. I think he was trying to make soup out of me. In the morning I got word that massive landslides from the cloud burst had blocked the road to the lake. I was broken-hearted, but couldn’t give up. I must have asked twenty people, including police and military, and they all told me it was closed. When I was just about to give up, I asked a couple more bikers and they told me with my bike it was possible. That was all I needed to hear and I headed up the road to check it out. About five km up, I bumped into my buddies from the BOM crew. They were on their way out from the lake. They had been stranded the night before. They told me about a road/path that would take me around the slides. Along with a handful of weed they sent me off with the confidence that I could make it. Just like they told me about, there was a rough route through the village and then up a very tough hillside. It bypassed the section that had the major slides on it. After reconnecting to the main road, you could see the area that was being repaired. There were a few other bikers who managed to make their way around it as well. We ended up being the only people into the lake that day since none of the tourist vehicles could make it. I ended u being the fist person to the lake that day. Nice empty roads. 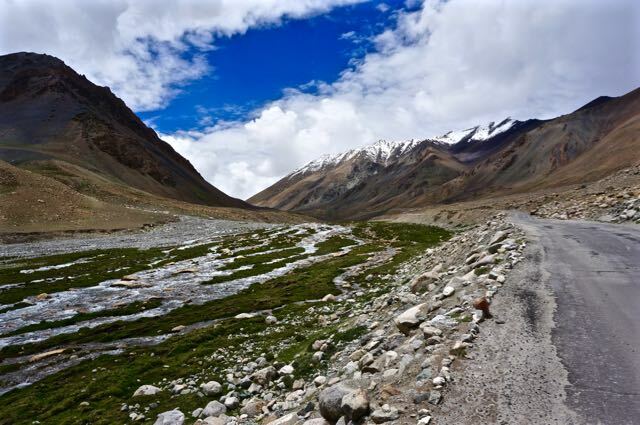 It’s similar to leaving the valley from Leh for Khardung La. The sketched into the rugged landscape. It was an incredible day riding in with nobody around. 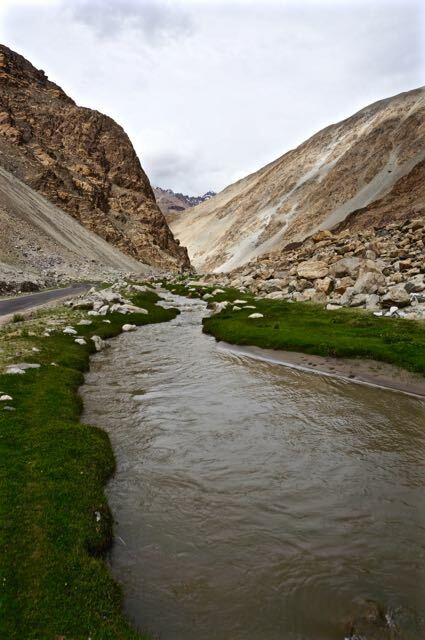 Pure peacefulness and a feeling of being very small in the humongous surroundings. 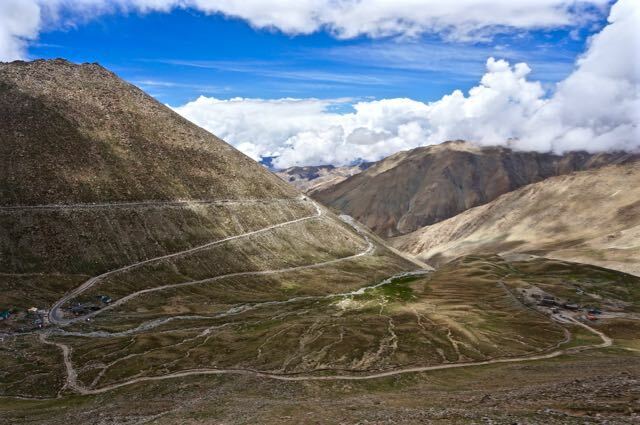 To get to the lake you have to cross Chang La, the third highest motor-able road in the world at 17,590 ft (5,360m). Incredible weather at over seventeen thousand feet. The military guys were super friendly and excited to see my bike. Some of them have been stationed there for two years. It must get pretty lonely sometimes. The route leads into some scenes straight from another planet. There are no words that can describe the raw beauty in these areas. 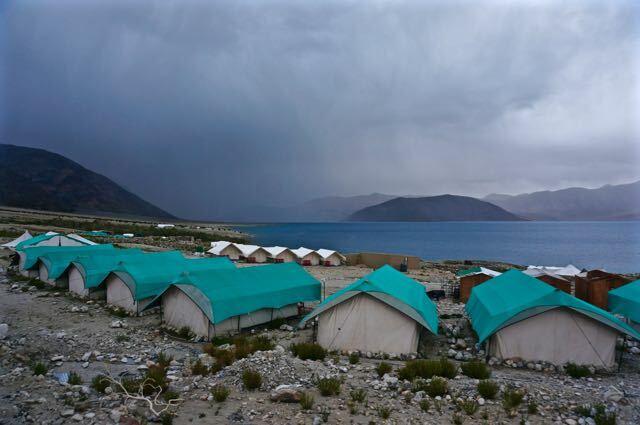 Deep in the valley are big military camps. It’s a very strategic location against both China and Pakistan. Who knew the Pakistanis loved Ice Hockey. 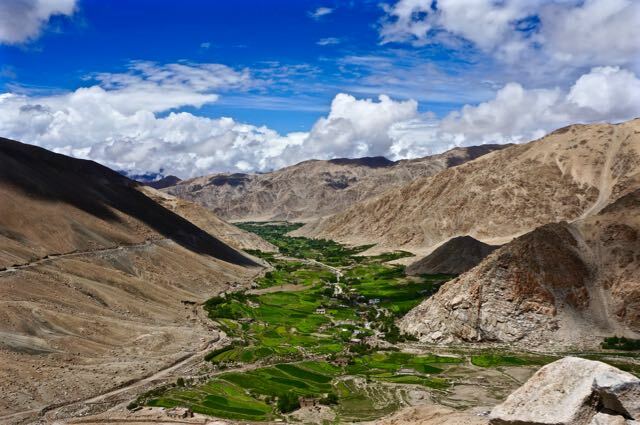 Leaving this wide valley leads you into a chute that slithers towards Pangong. Horses graze along the river. I really felt like I was exploring another planet through here. And then the massive lake slowly appears. It’s such a calm setting. I loved the sign at the lake-side. I started from Kuala Lumpur around eight months before. 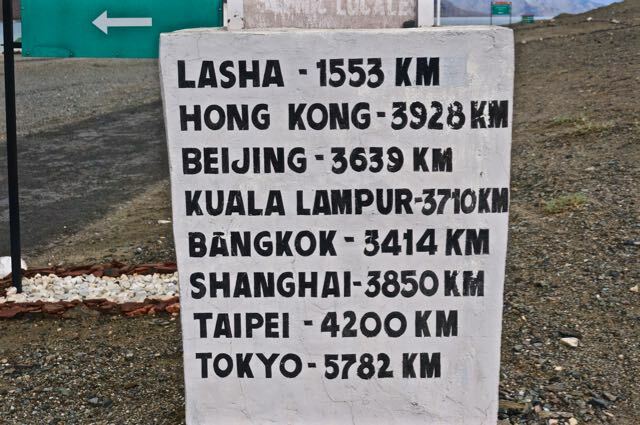 According the sign I was 3,710 km away, but I had ridden close to twenty thousand to reach this spot. I never had real great weather at the lake. The water looks the best colors when the sky is blue, but it still looked beautiful. Along the lake are tents for camping. Me and a couple of others found a homestay with cozy little rooms for about three dollars. The tents are a big of a rip off. A massive storm rolled in that night unleashing on India and China while we ate cold dhal and rice on the bedroom floor with finally getting some use out of the little wooden pipe that a guy had given me on the side of the road in Myanmar. The morning brought calm. The lake lye still and flat reflecting the popcorn clouds. 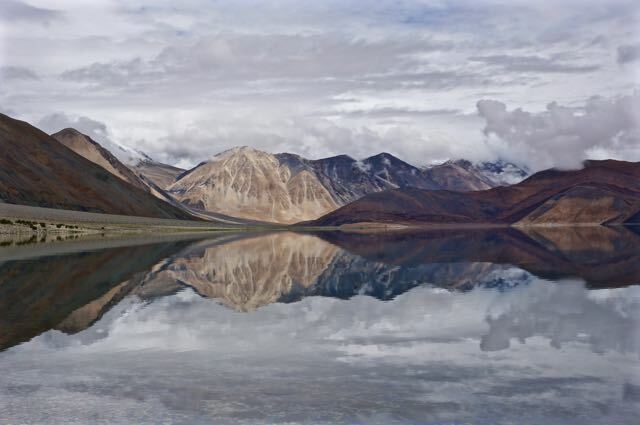 The different colored mountains as a backdrop created an epic scene. I could’ve easily sat at the lake edge all day looking out over the crystal clear water daydreaming. Pakistan was calling me and I had to make my way out after just one night. On a ridge looking over the big valley filled with army installations, I smoked a little bit and listened and watched the soldiers having target practice. 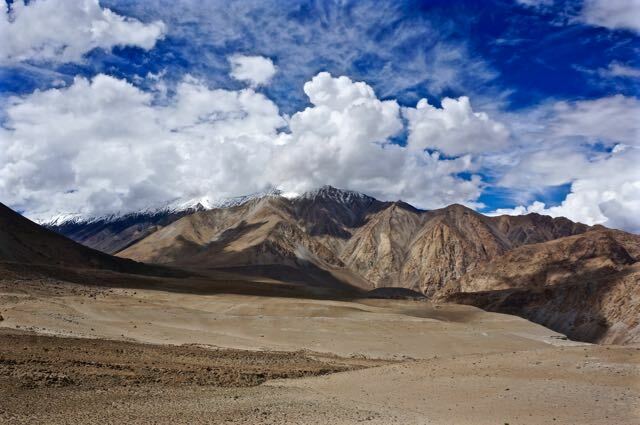 The echoes of the gun blasts filled the mountains. Kind of a cool experience. It might be the most breath-taking place I’ve ever been. 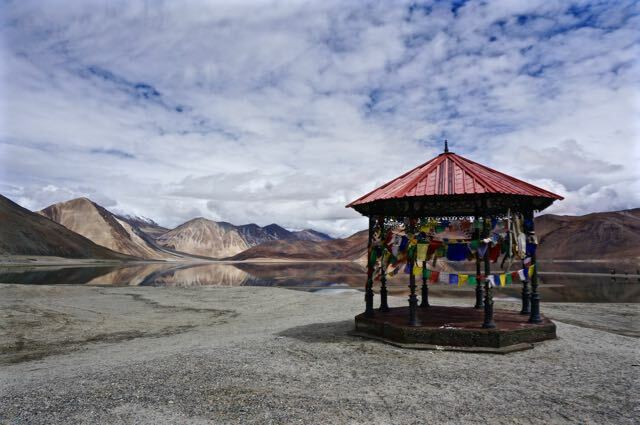 A memorable trip to Pangong lake, but now it was time to start heading towards Amritsar on the Pakistan border. 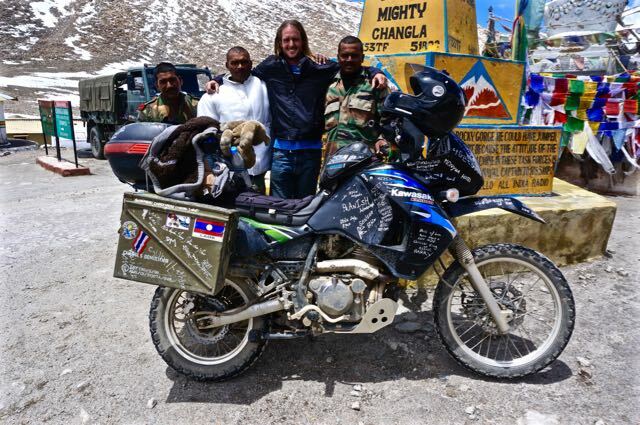 My Pakistan visa was only good for about six more days and I had a few days riding to get there. With all the landslides and road closures going on, I was hoping to find a way there. 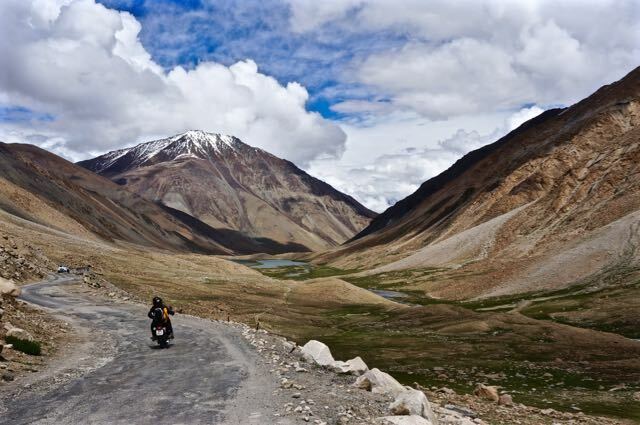 This entry was posted in adventure travel, Kashmir, Kawasaki KLR650, Motorcycle world travel, NW india travel, Photography and tagged adventure, best, chang la, china, India, kashmir, ladakh, motorcycle, pangong lake, pass, photography, tibet border, travel. Bookmark the permalink.